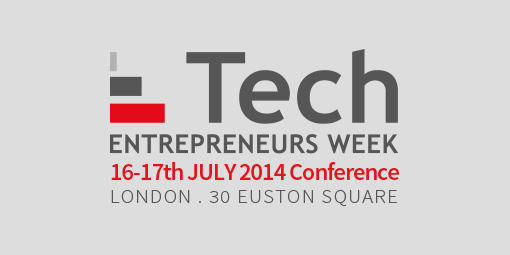 The Tech Entrepreneurs Week: How do you build a great technology company? “How would you build a great technology company?”: this was the theme of the 3rd edition of the Tech Entrepreneurs Week, which was a 2-day event (16th-17th July). The conference focused on Mobile, 3D Printing, Cutting Edge Technology and Digital Entertainment. But it was also the right destination for those willing to listen to inspirational entrepreneurs’ stories and get some valuable business advice. There were more than 50 amazing speakers, so these were two very busy days. Fortunately we had really nice tea breaks free to chat with experienced entrepreneurs, investors and big firms representatives as well as new or aspiring entrepreneurs. All the ingredients were there for a fruitful networking session but if you didn’t want to talk, you still could appreciate the impressive performance of the Full-Color 3D Printer from BotObjects, brought along by Martin Warner, the founder of the Tech Entrepreneurs Week, who is also the CEO of BotObjects. Definitely it was a really inspiring conference, and I do feel like I have actually learn something, and that my perspectives have slightly changed. I still don’t know how to build a great technology company but I have a clearer idea of what it means, and what the main challenges are. So here are some of my takeaways. I am interested in crowdfunding, a funding innovation that has proved to be a very efficient tool to collect seed funding, so I paid a particular attention to the topic. Darren Westlake, founder of Crowdcube, came to talk about the benefits of crowdfunding. Indeed, in addition to the financial aspect, the crowdfunding platform is an amazing way to make yourself known, get feedback on your product/service, test the market and gather a nice advocates’ community. However, Barry E James highlighted that there is actually three models of crowdfunding: the equity crowdfunding (e.g. Crowdcube), crowdlending (e.g. the Funding Circle and the reward-based crowdfunding (e.g. Kickstarter) The reward crowdfunding appears to be one of most popular solutions, since it is basically based on pre-orders: the company acquires customers before even starting to sell anything. But Barry James’ big point was the use of these platforms as a gold springboard to further investments. Indeed a good crowdfunding campaign will be considered as a valuable proof of concept by investors and will probably help companies to convince them easier. So crowdfunding is much more than just money! If you are interested in crowdfunding check out this online platform which compares British crowd-funding platforms and here are some tips to set up right incentives or make a good video which is the key element in a crowdfunding element. Also, we got an amazing and very inspirational talk from Benjamin Southwork, founder of Changeworks, who replied, almost chanted his reply, to people who think that Innovation or Creativity are the privileges of some lucky people. No, Creativity is the result of work; Innovation comes by trying, improving and testing. This was a refreshing and much appreciated intervention to remind you that one day, you too could be one of these speakers. Thank you! … And some other panellists were discussing the future of the world. It sounds a bit ambitious to say it like that but yes there were trying to understand to what extent the technology could be involved in our life in the next years. So according to Martin Warner, we will be all able to 3D-print everything we need at home using online database. James Whittaker, who has had an impressive career at Google and Microsoft, was wondering whether we will still use wearable devices to connect like mobiles, watches, glasses or even clothes; or whether screens will be integrated everywhere around us. Another big topic – prediction – has been tackled by Justin Lyon whose company Simudyne developed predictive solutions to help the decision making process, and it is quite impressive when you understand that he is able to simulate the behaviour of a crowd or compare the consequences of several business solutions. Indeed machines are more rational and can calculate better and faster than we can. But I can hear you saying “Oh my God! It is like in this Science Fiction movie I saw where the machines take the control and kill everyone”: don’t worry, according to him, the best decision is often a mix between the computer calculations results and the human analysis. There, I also met really promising young entrepreneurs like Shakot Hakim, founder of Studentblock – an online property agency designed to students, Fabrizio Dell’Acqua founder of Spotlime – an event booking application offering great deals, or even Gina Vasile, one of our Hatchery participants and founder of Xpand Media – a company aiming to assist firms in their transition to digital media. These two days were just amazing and I really wonder why the attendance at the event was not higher. So if you have the chance to get an invitation next year (or if you can afford the ticket), please go and get inspired! … And network!